"We try to live and farm here in ways that are at once simple, quiet and elegant. 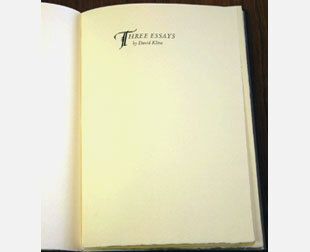 Our books, we hope, also reflect these qualities." Cleveland Heights, Ohio: Press on Scroll Road, 2016. Edition of 50. 7.75 x 5.75"; 22 pages. Printed from handset Cloister Lightface type on Twinrocker paper in an iron handpress. Wood engravings by Richard Wagener. Bound in marbled paper over boards. Bindings by Priscilla Spitler. Numbered. 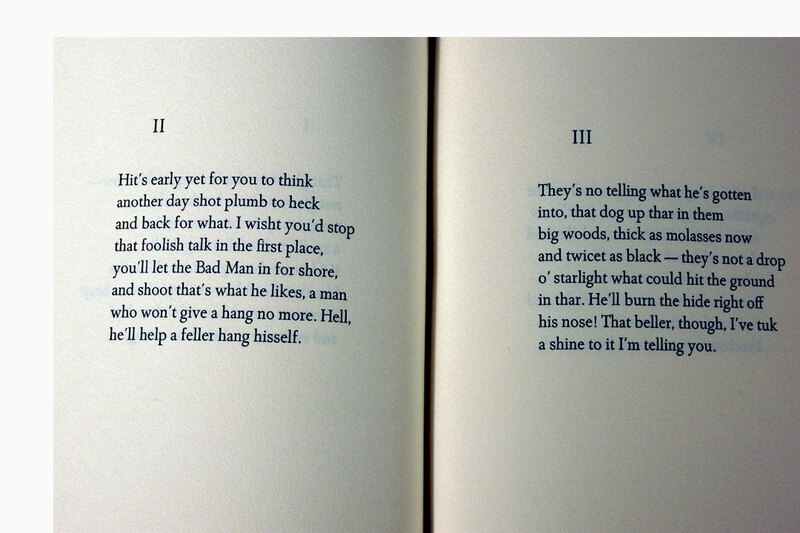 Ezra Pound's translations of poems by the 8th-century Chinese poet Rihaku first appeared in the Elkin Mathew's 1915 London edition of Cathay from which they are reprinted. Carrollton, Ohio: Press on Scroll Road, 2014. Edition of 60. 9.375 x 6.25"; 24 pages. Designed and composed in Cloister Lightface types. Printed on Twinrocker handmade paper on an iron handpress. Four engravings. 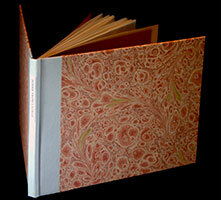 Bound by Priscilla Spitler in quarter-cloth with Pamela Smith's decorated papers over boards. Numbered. 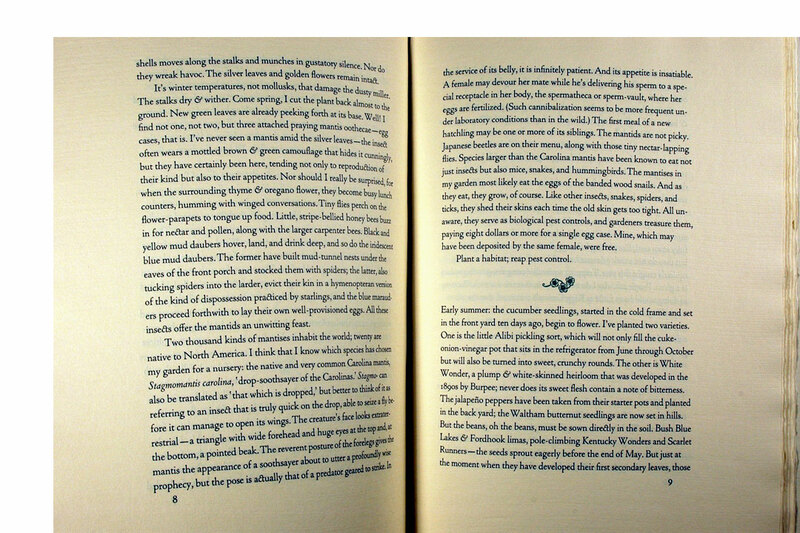 "The Shape of Water" originally appeared in the collection The Writer in the Garden, edited by Jane Garmey, published by Algonquin Books of Chapel Hill in 1999. 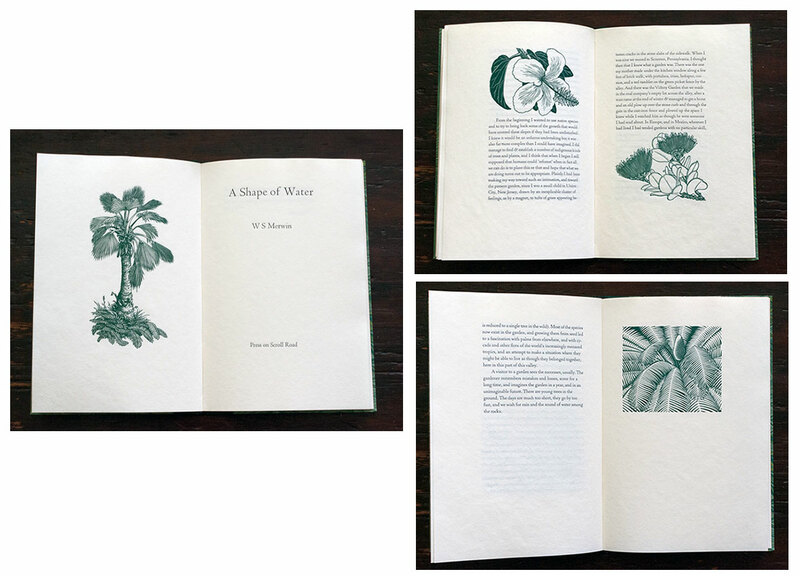 It is an essay about his garden at his home in Hawaii. www.merwinconservancy.org: "Appointed United States Poet Laureate by the Library of Congress in 2010, William Stanley Merwin has a career that has spanned six decades. A poet, translator, gardener and environmental activist, Merwin has become one of the most widely read and honored poets in America. "… He married Paula Dunaway, in 1983, and settled on Maui. For nearly 30 years, they have lived in a home that he designed and helped build, surrounded by acres of land once devastated and depleted from years of erosion, logging and toxic agricultural practices. Merwin has painstakingly restored the land into one of the most comprehensive palm forests in the world. He continues to live, write and garden in Hawaii." A Shape of Water, Introduction: "The garden, or what my wife and I have come to call the garden, follows a small winding valley on the north coast of the Hawaiian island of Maui. Half a mile or so beyond our property line on the seaward side the stream bed that is the keel of the valley emerges from under a thicket of pandanus trees into a grassy hollow at the top of the sea cliffs, where there was once a watercress pond, and then cuts through the edge to a series of shoulders and shelves and the rocky shoreline." Carrollton, Ohio: Press on Scroll Road, 2010. Edition of 54. 8.25 x 12.5"; 52 pages. Printed from handset Cloister Lightface on Frankfort Cream paper in an iron handpress. 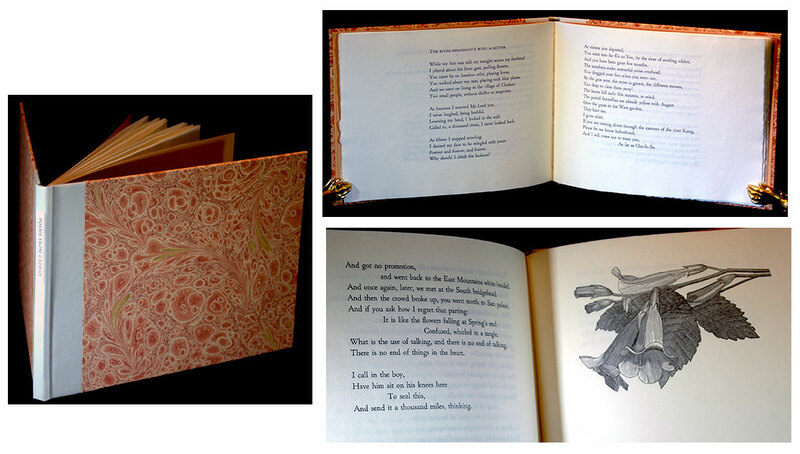 Includes an illustration by Joe Nutt, the author's brother. Prospectus: "Janet Lembke writes, gardens, and keeps cats in Staunton, Virginia. Her eighteen books include poetry, literary translations, and collections of essays on the natural world. In 2005, she received a grant from the National Endowment for the Arts to translate Virgil's Georgics, a poem on farming. She is a certified Virginia Master Gardener." This paean to gardening begins with this: "Plant a garden and you reap an array of surprises." And the last paragraph with this: "The garden brings not only flowers, fruits, and vegetables but also great joy. But the work put into it is not – can never be – sufficient recompense for its gifts. I shall pay the dryad's price for my harvest…." The calming sense of our greater cycles and truths is the experience of Harvests. Carrollton, Ohio: Press on Scroll Road, 2006. Edition of 60. 6.5 x 10.5"; 44 pages. 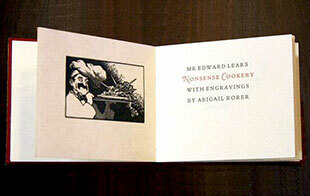 Printed from handset Cloister Lightface type on Twinrocker papers with an Ostrander-Seymour iron handpress. Two engravings by Abigail Rorer. 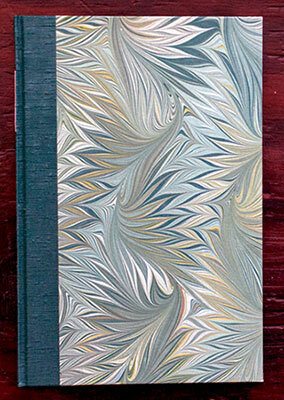 Bound in cloth-covered boards by Priscilla Spitler. Three essays – "Community," "Sharing Work with Children," and "The Value of Love" – reprinted here from Scratching the Woodchuck: "Nature on an Amish Farm by David Kline (University of Georgia Press)." Robert Baris: "David Kline is an old order Amish farmer in Ohio. He has had two books of essays published: Great Possessions and Scratching the Woodchuck." Miniatures printed by Robert Baris at Press on Scroll Road. Carrollton, Ohio: Press on Scroll Road, 2002. 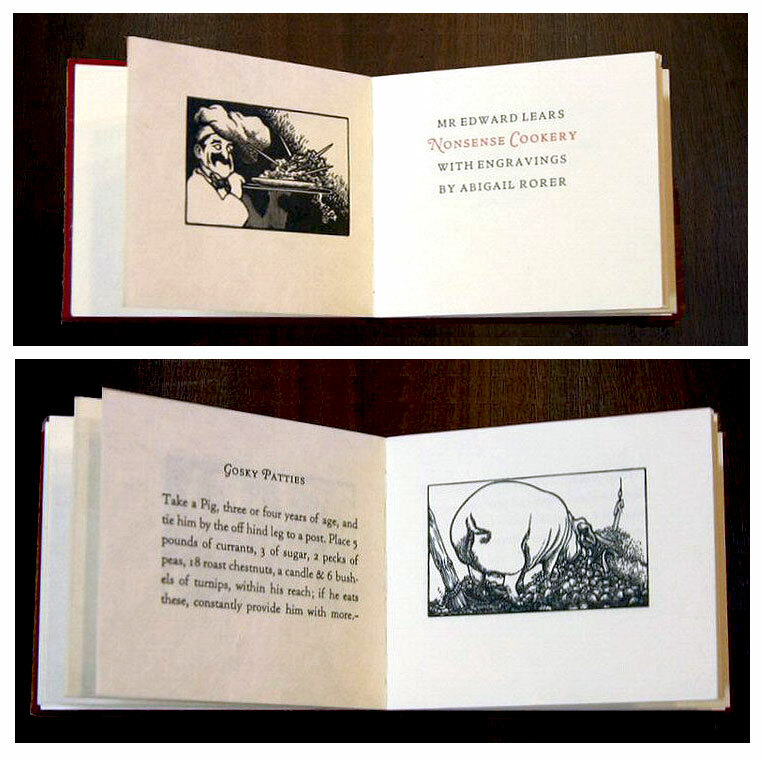 Edition of 69. 2-5/16" x 2-13/16"; 24 pages. Miniature book. Four engravings by Abigail Rorer. 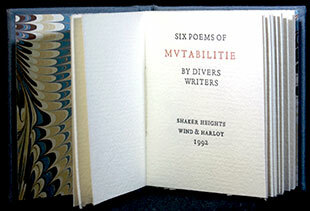 Printed on an iron handpress from handset Cloister Lightface type in two colors on Gampi Torinoko paper. Bound in cloth-covered boards. Signed by Abigail Rorer. Edward Lear (1812 - 1888), an English artist, illustrator, and poet, was known for his literary nonsense in poetry and prose. "Nonsense Cookery" is an extract from the "Nonsense Gazette" for August, 1870. It includes "Three Receipts for Domestic Cookery"; "To Make an Amblongus Pie"; "To Make Crumbobblious Cutlets"; and "To Make Gosky Patties". [Shaker Heights, Ohio]: Wind & Harlot, 1992. Edition of 74. 1.75 x 2.125"; 22 pages. Miniature. Marbled end papers. 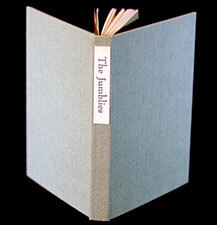 Bound in gray paper over boards with printed title label on spine. Numbered. Poems and authors: "Western Wind" (Anonymous); "The Passionate Shepherd to his Love" by Christopher Marlowe; "The Nymph's Reply" by Sir Walter Raleigh; "Go, Lovely Rose" by Edmund Waller; "Enwoi" by Ezra Pound; "Bookmark, Santa Teresa d'Avila" translation by Longfellow. [Shaker Heights, Ohio]: Wind & Harlot, 1991. Edition of 74. 2 15/16 x 2 3/16"; 28 pages. Miniature book. Six full color illustrations by Bonnie Baris. Marbled end papers. 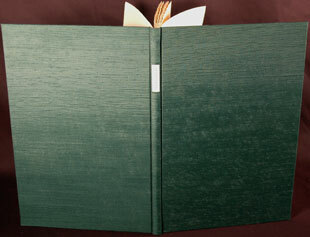 Bound in green paper covered boards with printed paper title label on spine. Numbered. Edward Lear (1812 - 1888) — English artist, illustrator, and poet. This version with illustrations by Bonnie Baris. Carrollton, Ohio: Press on Scroll Road, 2008. Edition of 48. 6 x 9"; 44 pages. Letterpress printed from handset DeRoos types on Rives paper. 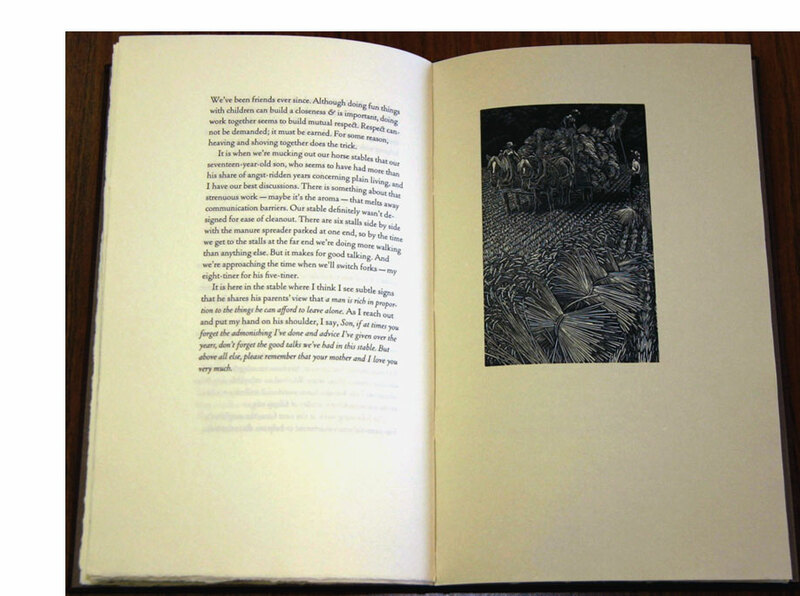 Wood engravings by Gaylord Schanilec. 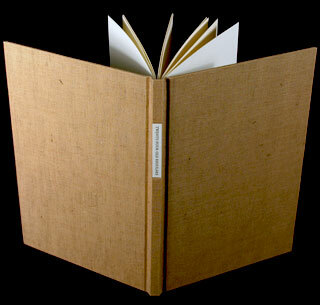 Bound in cloth covered boards by Campbell-Logan. Paper title label on spine. they aint nobody pity pore. but never oncet bent down nor broke. against a powdered cheek oncet more. Press on Scroll Road: "Maurice Manning's first book of poems, Lawrence Booth's Book of Visions, was selected in 2000 as the year's winner of the Yale Younger Poets competition and was published in 2001. This was followed by A Companion for Owls, published in 2004, and Bucolics in 2007. ... When not teaching at Indiana University and Warren Wilson College, you'll find the author on his farm near Springfield, Kentucky."